For those of you who have been following our winter trip to the arid Kgalagadi Transfrontier Park in South Africa’s far North West, you will know that this stunningly beautiful and wild wilderness is certainly living up to its reputation as one of the great true wilderness parks still left in South Africa. 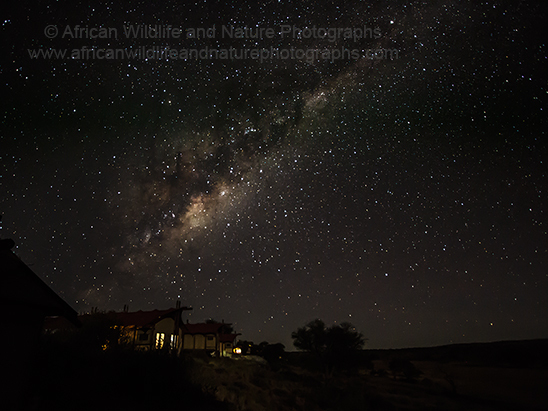 As the Kgalagadi Transfrontier Park at Twee Rivieren (its southern most gateway) is over 250 km from any form of light pollution and we were 160 km further North, it was a great opportunity for me to try, for the first time, some astrophotography. I had done some research on this aspect of photography with respect to equipment and settings for the camera, location of the celestial bodies and the phase of the moon as any form of major light pollution in the sky would have negative effects on the outcome of the photograph. I set out to take a photograph of the Milky Way over the Kgalagadi Transfrontier Park somewhere and luckily the elements that I couldn't control aligned quite nicely. You can see the result here. I think it turned out quite well even if I say so myself. Now our 2nd full day in the Kalagadi Transfrontier Park again saw us up, and ready to get our permit to exit the camp by 7-30am (earliest time you can get your permit in June). We were this morning going a little further south to the places we had missed on our way to the camp a couple of days ago namely Dertiende Boorgat (13th Borehole) and Veertiende Boorgat (14th Borehole). These waterholes had been well documented as waterholes with a lot of possible ‘action’ in the Kgaladadi Transfrontier Park. We had heard in the night, as we did the previous night, roars from a male lion, which echoed loud and long into the cold, still night. So it wasn’t much of a surprise that after only 10 minutes out of camp we came across, walking along the top of the dune a fine specimen of what, no doubt, we had been hearing the previous night and early morning, a large male Kalahari Black-maned lion, a beast many people come to the Kgalagadi Transfrontier Park to see. Much to our frustration its was not a good photographic opportunity as there were also 3 cars following us and the lion was moving quite quickly through the desert scrub. until eventually we reached the 13th Borehole. 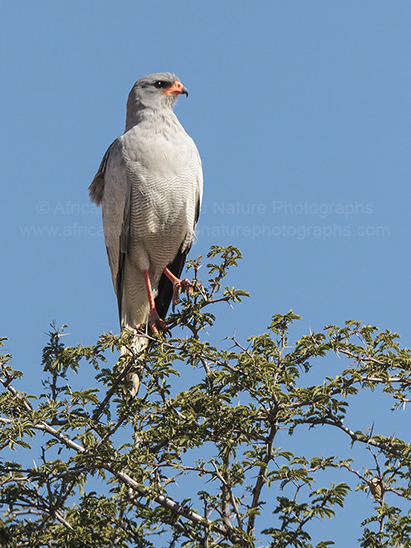 We parked up ready as always for any serious action but we didn’t get or see anything of great interest but still a lot of birds coming and going to the waterhole as well as herds of Wildebeest (Connochaetes taurinus) and Gemsbok. (Oryx gazella). We moved on to the 14th Borehole which was much the same. After an hour or so we decided to head back to camp for lunch. After lunch and short snooze we set off for the main camp in the area, Mata Mata which was about 3 km from where we were staying at the ‘Kalahari Tented Camp’. There are 3 main camps in the Kgalagadi Transfrontier Park and Mata Mata is one of those. 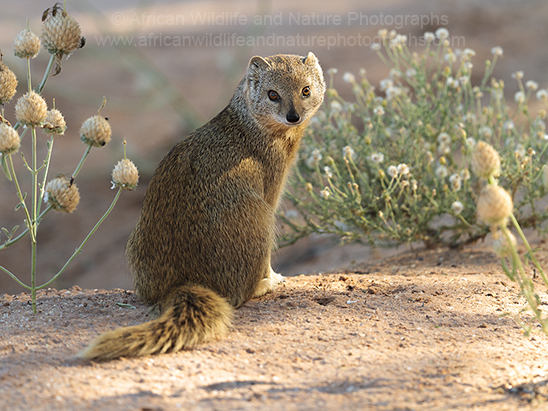 On entering the camp we noticed a ‘troop’ or ‘band of yellow mongoose going about their daily business. Scurrying between the shrubs always on the lookout for danger and of course food. They are so entertaining that we sat and watched them for a while. 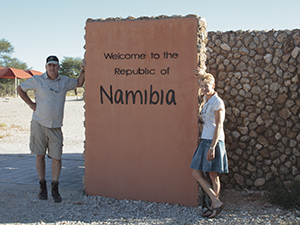 We then proceeded to the border post between South Africa and Namibia situated in the Mata Mata camp. Transfrontier Park without passports and or ID as about 200m on the Namiban side of the border is a small farm stall/shop where you can buy tourist type trinkets, frozen meat, food and deliciousssssss Namibian home baked rusks (a type of biscuit we get here in Southern Africa). On crossing back into South Africa we though we would spend the last hour of daylight slowly driving from Mata Mata to the ‘Sitzas’ waterhole which was about 10 km from the camp. We were rewarded with a sighting of a cheetah crossing the sandy road in front of us but unfortunately disappearing over the dunes with no opportunity to photograph this magnificent Kgalagadi Transfrontier Park big cat. This would be our last night in the Kalahari Tented Camp as tomorrow we would head further north into the Kgalagadi Transfrontier Park and the ‘Nossob Camp’.